The sub was expected to return to Copenhagen. 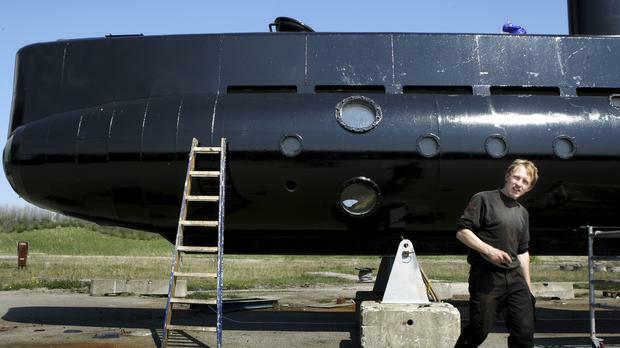 An amateur-built submarine financed through crowd-funding has sunk in Denmark's waters south of Copenhagen - but the owner and builder who was alone on board is safe, the navy said. The navy initially said the UC3 Nautilus was "found sailing" south of Copenhagen. But navy spokesman Anders Damgaard later said the 40-ton, nearly 18-metrs-long submarine had sunk. Peter Madsen, who built the vessel that was launched in 2008, had "been taken over to one of our ships", Mr Damgaard said. He declined to give further details. Footage aired on Denmark's TV2 channel showed the 46-year-old getting off what seemed to be a private boat and making a thumbs-up sign as he walked away. "I am fine but sad because Nautilus went down," he told Denmark's TV2 channel. Mr Madsen said "a minor problem with a ballast tank ... turned into a major issue" that ultimately caused the vessel - considered the largest privately-built of its kind in the world - to sink. "It took about 30 seconds for Nautilus to sink and I couldn't close any hatches or anything. But I guess that was pretty good because I otherwise still would have been down there." The ballast tank is a compartment that holds water, which is used as ballast to provide stability for a vessel. "He told us that the journalist who also had been on board had been dropped off on Thursday evening," Mr Damgaard said. Swedish media said the reporter was Swedish. "They were the only two on board yesterday." "He told us he had technical problems" to explain why the submarine failed to respond to radio contact, Mr Damgaard said. By Sylvie Corbet, Associated Press Some 180,000 bees kept in in hives on Notre Dame’s lead roof have been discovered alive despite the destructive blaze at the Paris cathedral.